Here in Louisiana we love our red beans and rice with sausage! Susie Kelly has raised the bar with this recipe! With this mixture, deep fry it all together, and serve with a Creole Style dipping sauce! Russell Kelly says, no matter how many they make, there never is any left! Mix together rice, red beans, onions sausage, tasso or ham, and 2 tablespoons breadcrumbs. Sprinkle on hot sauce, then stir in one egg to form a tight batter. Whisk milk and remaining egg to make an egg wash.
Form small balls from red beans, rice, sausage, OR tasso, OR ham mixture. Roll in flour, then coat with egg wash and roll in the remaining breadcrumbs. Heat oil to 360 degrees F and fry until golden brown. Drain on paper towels and serve immediately with Creole Dipping Sauce, or your favorite dipping sauce. 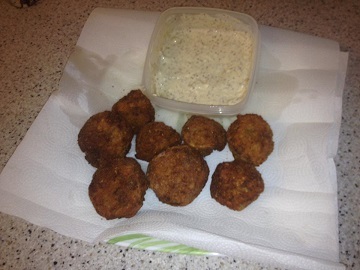 Creole Dipping Sauce: Mix one part mayonnaise to one part Creole Mustard, and serve with the red beans and rice balls. Recipe and Photo courtesy of Susie Kelly. Used with permission.